“Ohay? gozaimasu! !” The greeting rings out as we step through the door at Chef Naoko Bento Café on SW Jefferson Street in downtown Portland. You don’t often hear the words in Portland, and it’s generally a reassuring sign that you are in the right place. Young and old Japanese families, women in search of the light and the healthy, and in-the-know locals pour into Naoko Tamura’s serene, minimalist café at midday to get a taste of her Oregon-sourced lunches. Since opening in 2008, the Tokyo-born Tamura has served a lunch that still can’t be found anywhere else in Portland: traditional, compartmentalized bento boxes fashioned from carefully procured farm-fresh ingredients, all beautifully arranged. These artful Japanese “lunch boxes” are a long way from the “rice and teriyaki chicken bowls” that pass for bento in America. But don’t expect the eye-widening, palate-expanding flavors of the trending izakayas or the innovative sushi bars. At Naoko’s, it’s all about clean flavors and a healthy equilibrium. 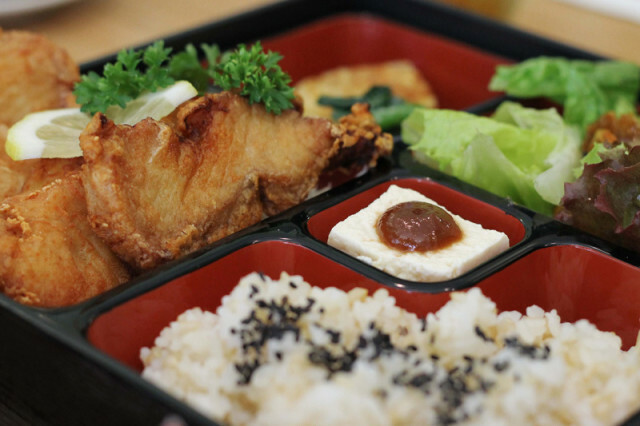 Each bento box is segmented into five subdivisions: tamagoyaki, a sweet, rectangular Japanese omelet; tofu dengaku, a silken bite of local Ota tofu crowned with sweet miso sauce; an expertly seasoned, market-driven salad; a healthy portion of brown and white rice (one of the few imports on the menu); and a changing main attraction, perhaps a braise of tomato and chicken from Yamhill County’s esteemed Kookoolan Farm ($9), or a slab of ginger-glossed Wild Coho salmon from Alaska ($14). The chalkboard overhead reads like a road map of respected Oregon producers: “greens from Ayers Creek Farms, pork from Sweet Briar Farm, peas from Gathering Together Farm.” Tamura’s deep-seeded focus on local and healthy is influenced by mother’s pioneering organic restaurant in Tokyo, which inspired Japan’s natural foods movement in the 1970s. But Tamura’s rotating specials sacrifice nothing for the sake of healthy eating. One day, wild Oregon ling cod ($15), lightly fried but soft and flaky inside, found its way into my lacquered box. Another day, pork shumai dumplings ($15) were prepared “Naoko-style”—coated in earthy oats instead of a noodle wrapper, topped with a mushroom, and served with a swab of wasabi. Still, some of the small pleasures shouldn’t be overlooked. Don’t miss the classic miso soup ($2), fantastically perfumed with salty seaweed broth (made from scratch, unlike the usual powdered mixes), or the unconventional “Mocheese” ($3.75), strips of rice cake and cheese pressed and crisped like the burnt gooey ends of a grilled cheese sandwich. Naoko’s bento lunch is sort of like getting a lunch box from your mother: Tamura has put a lot of love and thought into every bite, and you don’t have to worry about overeating, as portions have been prescribed. The only difference: this lunch box is packed full of Oregon’s fine meat and veggies, and there is no risk of losing your milk money.